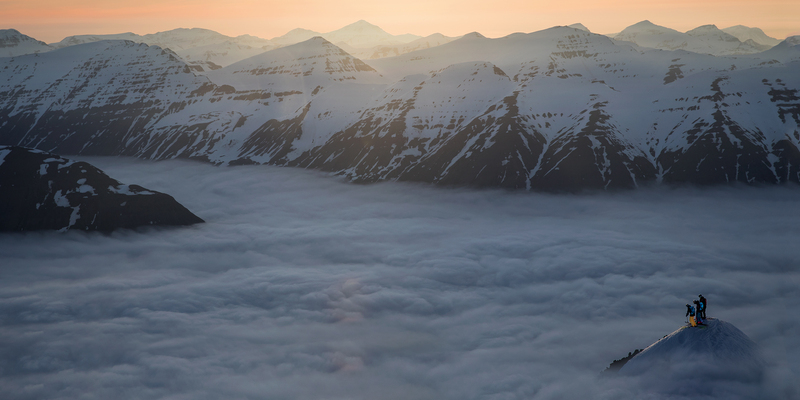 In May, Sven Kueenle and Bene Mayr traveled to Iceland. They were set to shoot with the crew from “Legs of Steel” and celebrate the end of the world cup season with Felix Neureuther. An epic guy trip – Three Men on the Slopes – with lots of fun and extreme downhill runs in the north of this Bogner-style dream island. Days 1+2 Nooo! You touch down in Reykjavik and it is 70 degrees – in May. The Icelanders say that it never gets this warm, not even in August. The mountains should be snow-topped, yet there is nothing but rocks as far as the eye can see. Still, we are all in awe of nature here. Senior pilot Sven quickly prepared a Cessna so we could use the perfect weather for a fantastic sightseeing flight over the sandbanks and glaciers of the west coast. Of course, Felix was the guest of honor on board. Then we traveled north to the Viking Lodge. It is located on a peninsula between Skagafjord and (oh boy, these Icelandic names) Eyjafjörðu. The cozy lodge offers great food and a Jacuzzi for sore muscles – and a chopper parked right outside, just as we neo-Vikings like it. Day 3 This trip already feels like something very special. Not just for the amazing natural surroundings, but also because we go skiing in the afternoon here. Crazy. We have the best light in the evening – and since daylight hours are so long here, we can ski until 10 p.m. Entertainment is on the agenda in the mornings – it kind of feels like a camping trip with the Boy Scouts. Today, Sven even snuggled up to an Icelandic horse. And we‘ll work on that whole horseback riding thing, right, Sven?! Day 5 Yeah! Today, the three of us jumped over the Silfra Rift. One jump to get from the Eurasian plate to the North American plate. You can only do that here. We also took motocross bikes and zoomed across Dalvik beach – great fun, and Mr. Neureuther was right in the thick of things, of course! The Icelandic volcanic rock makes the sand look black, which is a great contrast to the snow-covered mountains in the background. The air is perfectly clean here, and you have an incredible view from the peak. Day 7 Good-bye, Iceland! Party in Reykjavik last night, but the cut-off was one beer each, because it is so hugely expensive here. The Icelanders are crazy in that respect. Still, we‘ll be back soon! "GOOD-BYE ICELAND. WE\'LL BE BACK SOON."